Originally published under the title, "On the 10th Anniversary of London's 7/7 bombings, Fear of Islamist Terror Still Reigns." 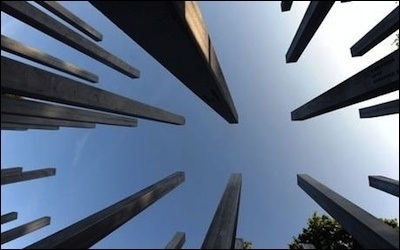 An ant's-eye view of the 52 stainless steel pillars comprising the 7/7 memorial in London's Hyde Park, one for each of the victims. There are plenty of people who until last week weren't particularly moved by the Islamist terror threat in the United Kingdom, or indeed around the world. The massacre in Sousse, Tunisia, may just have woken a few people up to the reality that less than 100 miles away from Europe, holidaymakers were under threat from Islamic fundamentalism. And we now know that this threat is just as applicable inside Europe as it is just outside. It has been 10 years since Islamist terrorists blew up buses and tube lines in the name of radical Islam, and despite the tightening of extremism laws, the marked increase in the surveillance state, and the kindly words offered to British Muslim communities by (now former) government ministers – not very much has changed. Britons, it turns out, feel more under threat by radical Islam than they did just after 9/11, when fear was at its assumed peak. Britons feel more under threat by radical Islam than they did just after 9/11. The political left, and that includes swathes of the Conservative Party, will tell you that this is because of the "right-wing media" portraying Islam as synonymous with evil. Those papers' editors, the same as this one, will tell you that we don't invent the news, we just report it. Not reporting it would be a dereliction of duty – a task that the BBC takes care of just fine when it comes to British journalism. Plus, despite what the 'Islamophobia lobby' will tell you, hate crimes against Muslims in the United Kingdom and across Europe are not on the rise. But it is understandable why British fears are at an all-time high. Think Rotherham, think Lee Rigby, think about the complex recruiting tactics that Islamists use in the United Kingdom, and the propaganda routines they pull to try and elicit support and sympathy, while maintaining memberships of some of the most vile organisations around. Think about the self-appointed spokesmen that appear on our TVs, the intolerances perpetuated in the name of ordinary Muslims, and the associations and affiliations made by publicly elected officials in their names, not to mention the fact that the doyens of the left laud and congratulate such things. Maybe, just maybe, some of these issues are what contribute to the atmosphere in Britain. And instead of blaming those who aren't politically correct about it all, maybe those of us from Muslim backgrounds should be more vocal about it all, rather than saying, "Well, what can I do?" I was born to an immigrant family in Uxbridge, West London. By and large the sum total of my aspirations growing up was to own some kind of retail shop, or maybe a fast food restaurant like my father did. But when I saw what was going on at Westminster University – where I studied politics as more of a personal interest than an intended profession – I decided I had to do something. The challenge isn't just tackling the rise and marketing of Islamism. It is fostering something else. I set up an anti-extremism pressure group that sought to highlight extremism and recruitment tactics on UK university campuses. That organisation was subsequently used by police and government authorities to help find out where extremist hotspots were in the country. But as I kept saying, and keep saying, to anyone who will listen, the problem is not just tackling the rise of Islamism, and the marketing job that extremists have done surrounding it. It is providing and fostering something else. The United States, where I write this from, certainly has its own homegrown extremism problems. But before its current president, it still projected a world view, it still projected values, and it still projected something that gave its citizens something to cling onto and associate with. I suppose all of these things put together can be described as a reason to be patriotic. British politicians, our political commentators, our academics and even many of our own citizens, however, would seemingly rather stare at their shoes and search around for reasons by which to excuse the behaviour of Islamists, or indeed try to "understand" them. Instead of trying to project values, we've become enslaved to this idea of multiculturalism, and all of the trappings of it – which includes giving up our own, British culture. These are the reasons why fear, specifically of the Islamist threat, still looms so large in our society. And there's only one solution: let's stand for something again.